At this very moment while writing this blog I can hear the trumpets and other musical instruments outside my window. I take a look outside and see many people and musicians walking in a straight line in my street. They are preparing for the most important week of the year, Semana Santa. Semana Santa is, in my opinion, the most interesting celebration in Málaga. It is called Semana Santa because it means holy week. Me, as a down to earth dutchie, find it quite hard to imagine how intense and important this week is for the Malagueños. I think to understand this you have to know more about the history behind this week and experience it for yourself. So, I did some research and was surprised by the stories behind it. There are a few important historical facts that you should know about this week. Well, I would love to tell you guys more about it! It’s important to know about the processions. The processions are a way for people to express their religeous beliefs and to remember the stories of Jesus Christ. More than 40 processions are organized during Semana Santa week in Málaga. The processions take place at different times during the day and even during the night (for me, someone who lives in the centre, this will mean a few sleepless nights) but I bet it’s going to be totally worth it. In Malaga, there are different “brotherhoods”. Every brotherhood has its own “ Trono” (like a throne). They are extremely heavy and are carried by strong Spanish men during the Semana Santa celebration, yes I know ladies, already a good reason to watch the parade. The Trono dipicts the many stories about the death of Jesus Christ, for example; the last supper and Jesus when he is betrayed by Judas. For the men, it is an honour to carry the Trono. The procession starts with the “ penitents” also called the Nazarenes. Which the penitents from the story present. They wear costumes with “capirotes” (pointed caps) to ensure anonymity and they walk in front of the procession. They are then followed by men carrying large candles and incense. Next comes the first Trono with carriers. This is followed by musicians, but sometimes the Trono is carried in silence. After that another group of Nazernos follows who (sometimes) carry a large cross. Finally comes the virgin Mary, which is the final part of the parade. Releasing a prisoner? Yes, you read that right. I was shocked when I first heard this and wanted to take the first plane back to Holland. But instead of booking a flight back to Holland I looked for more information about this unusual story on the internet. When you ask the Malagueños about it they don’t react that surprised. For them, it’s something normal and they don’t see the big deal of it. Every year they free one of the prisoners in Málaga. The reason for this is because many years ago when the plague broke out in Spain a lot of citizens died. Due to the lack of citizens, the prisoners offered to carry a certain Trono during the Processions and then returned to prison afterwards. To remember this and to thank them, a tradition has been installed to release one prisoner a year during the Semana Santa celebration. Domingo the Ramos: The start of Semana Santa is on Sunday 14th April. One of the processions that take place that day is from the brotherhood Fusionadas. The famous actor Antonio Banderas from Malaga is also part of this brotherhood (hence, many people come to watch). Lunes Santo: This day includes dancing and singing combined with a band that chances every year. Martes Santo: Another day with more processions. One of the brotherhoods even stretch the arms during the carry of the throne. Miércoles Santo: This day the prisoner is freed. You can see this ceremony in the evening in front of the Cathedral. Jueves Santo: On this day you can see singing soldiers walking from the port of Malaga to the centre, joined by a goat. 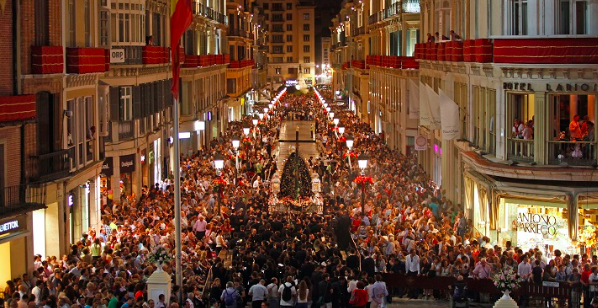 Viernes Santo: You can go to the city centre to watch the city decorated in lights. Domingo de resurrección: One last procession, but will all the brotherhoods together. More information and routes you can find on the internet. Tips for the Semana Santa. Tip 1: Most of the shops are closed and only open in the morning. So keep this in mind in case you have to buy some groceries. Tip 2: Make a schedule for yourself with all of the processions and things you want to see. It will be difficult to see everything. Tip 3: If you are planning to come by car, you will not be able to park in the centre so think again! A good alternative is parking by the shopping mall Plaza Mayor, a few minutes outside of the centre. 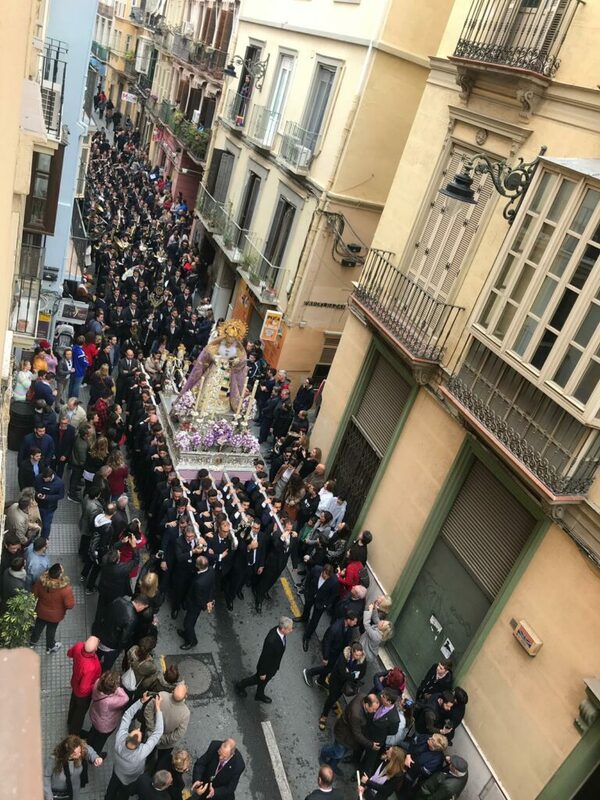 Tip 4: Download an app, For example, Cofradias MLG; to find out where each part of any procession is at any given time, and also for last-minute changes to the schedule, such as cancellations or delays. 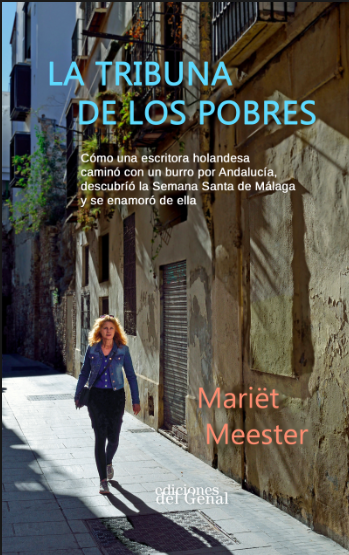 A Dutch writer Mariët Meester (no it’s not a coincidence that we have the same last name, it’s my aunt), has written a book mainly about this week in Málaga. It has been translated from Dutch into Spanish. She lived in Sevilla and got inspired by the stories she heard from the locals about this week. To find out more about this week she settled down in Málaga and experienced the week for herself. She is an expert when it comes to Semana Santa and Spain and knows a lot about the history behind it. So to give you guys more information about this week I did an interview with her. What inspired you to write the book “La Tribuna de Los Pobres”. What was your first impression of this week? 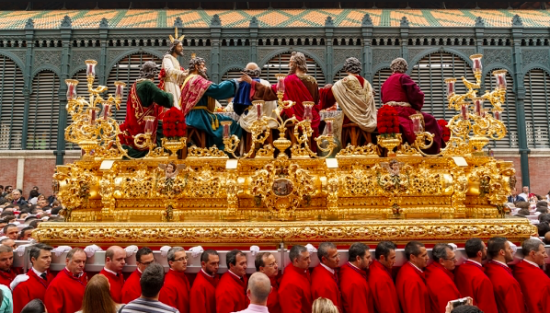 What do you think is the most interesting about Semana Santa? What would you definitely recommend doing during the Semana Santa? Are there any tips about the Semana Santa that you would like to share with the students? I hope I have got you guys as excited as I am for Semana Santa. If you have any questions don’t hesitate to ask me whenever you want to know more. Have fun next week !